A large catfish attacked a teenager in a German lake. A school of piranha devours a busload of passengers that crashed in an Amazonian river. These legends have found their way into literature, tales, folklore and now television. From tiny piranha that can tear apart humans in the Amazon to large killer catfish in India that feed on dead bodies, Animal Planet tracks the world’s most ferocious fish. 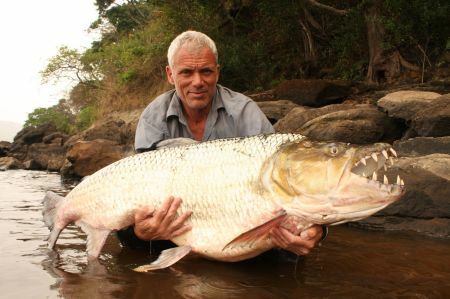 In the new seven-part series RIVER MONSTERS, biologist Jeremy Wade travels across the world to solve these freshwater mysteries, debunk myths, and track down harrowing tales. Follow Jeremy in his face-to-face encounters with mysterious flesh-eating predators, gargantuan fish and other RIVER MONSTERS will air on Animal Planet every Wednesday at 9 pm in September and October. The episodes will repeat every Thursday at 11 pm. Alligator Gar : In the Deep South resides is a river monster with the reputation of a devil. Blamed for a series of violent attacks on humans, this creature is said to be as vicious as a shark and as big as an alligator. The authorities said it should be annihilated, but not all are so quick to condemn it. Jeremy heads to Texas on its trail in an attempt to uncover the facts behind this animal’s notoriety. Helped by local expertise and with his own wits honed sharp, he finds new ways to reveal the truth about the monster Alligator Gar. European Maneater : Reports of an attack on a swimmer in a lake close to Berlin is the starting point for an intense and shocking investigation. Jeremy travels to Germany where he meets modern-day victims of a beast that has been raising its snout above the surface of freshwaters in Europe regularly over the past 700 years. Investigations travel to Spain where Jeremy discovers firsthand that the Wels catfish is a living, breathing aggressive predator growing to man-eating proportions capable of everything depicted in medieval records and more. Piranha : In 1976, a packed coach crashed into the Amazon killing 39 people. By the time the bodies were pulled out by rescuers some had been so viciously mutilated by Piranha they could only be identified by their clothes. Tracking down survivors and eyewitnesses of Piranha attacks, Jeremy reveals why the Piranha fills our nightmares. Killer Catfish : Two years ago, on the treacherous Kali River, Northern India, Jeremy unearthed the mother of all fisherman’s tales and the ultimate freshwater horror: a super-sized freshwater fish turned man-eater. Jeremy takes on the biggest, toughest challenge he has ever faced as he heads back to the Himalayas to separate fact from fiction and track down the monstrous beast. Amazon Assassins : In the darkest depths of the Amazon lurks a dinosaur. Legends tell of an evil spirit inhabiting an enormous fish. Taller than a man, it is covered in scales and crushes its prey with a tongue made of bone. 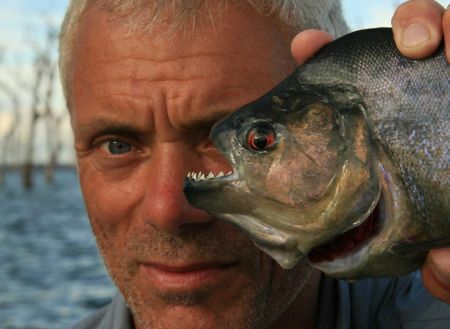 Jeremy Wade has encountered this creature once before and he came out second best. He’s taking no chances in the rematch. Amazon Flesheaters : A man swallowed whole by a fish. A body eaten alive from within. Another penetrated in a most unnatural fashion, and yet more with multiple stab wounds. Jeremy is in pursuit of these notorious killers to discover the facts – to determine if their crimes are real and their methods as gruesome as reported. Freshwater Shark : No fish inspires the same terror as the shark, a creature with an insatiable hunger for brutal violence. But at least these killers are confined to the oceans. Or are they? Jeremy investigates whether it is possible for sharks to live in freshwater, and if so just how far inland these vicious predators will bring their reign of terror.